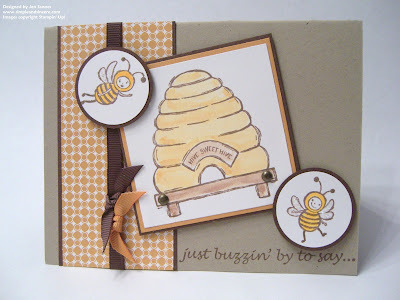 The card base is made out of Kraft cardstock with a strip of More Mustard designer paper layered on to Chocolate Chip cardstock. I also added some Chocolate Chip and More Mustard grosgrain ribbon. 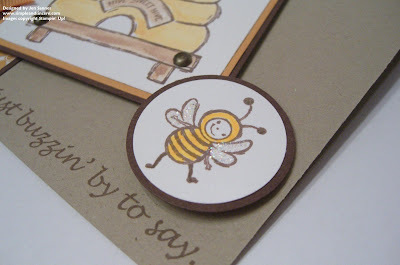 I stamped the images in Basic Brown ink on Whisper White cardstock and colored them with my Aqua Painter and More Mustard and Close to Cocoa ink pads. 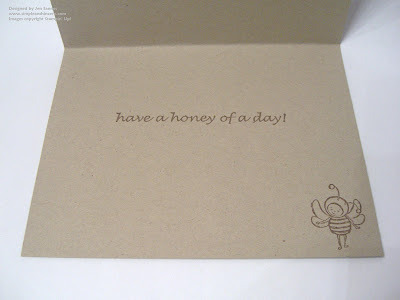 I accented the little bees' wings with some Dazzling Diamonds glitter and added brads to the bee hive stand.